After two weeks in France, let's take a look at where we are. Provence is the southeastern coastal area (purple) located in the lower right on the map. 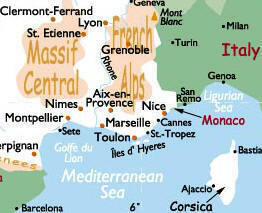 It was Rome's first "province" outside of Italy proper and thus the name Provence [prah-vahnse] stuck. You can see from the map in the center (above), the mountains of the Alps to the southeast. 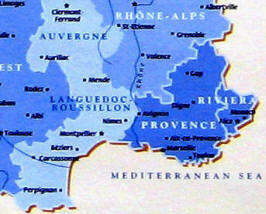 Below: the Region of Provence (left), the counties of Provence (center) and the cities. You can see our trip went from Finale Liguria in Italy along the coast through Nice, Cannes, Antibes, Mougins, Grasse, St-Paul-de-Vence, Draguignan, Flayosc, Fréjus, St-Tropez, Marseille, Cassis, Aix-en-Provence to Avignon. 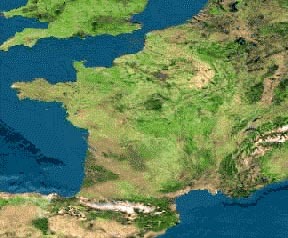 We will go on to St-Remy-en-Provence, Arles, Nîmes and Orange before leaving Provence and heading northeast to Grenoble in the Rhône-Alpes region of France. By staying in Provence for 19 days (25% of our time in France), we may have to sacrifice in other areas. But it was worth it. 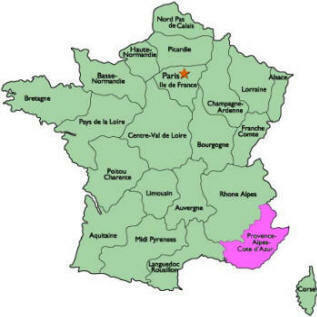 The area we are in is called the Vaucluse which comes from the Roman "vallis clausa" (closed valley). It covers 2,200 mi2 and is bordered by the Rhône River to the west, the Durance River in the south and the foothills of the Alps to the east. Notice the Regional de Camargue (below Arles). It is a famous area that we were not able to visit. Map courtesy of Provence Beyond. 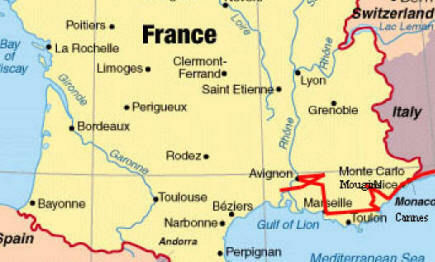 Avignon is situated at the central western edge of the Vaucluse near the junction of the Rhône and the Durance rivers. It is the chief city of the Vaucluse with a population of only 90,000, but it seemed much higher with all the festivities and the people crowding the streets. The city is surrounded by ramparts and 3 miles of walls interrupted by 39 towers and seven gates. I woke up at 7:45, but slept again until 11:45 when I got up with a little more than five hours sleep. I was on the telephone at 12:15 with calls to and from Silvia regarding our credit card. I finally got up at 1:15. From the large map (lower left) you can see the size of the entire city at the junction of the two rivers. It shows the old walled city, more evident in the middle map in the upper left. The small map (lower right) is just of the walled city. This city is so much about its history, it is impossible to describe it without giving some details of it. Avignon was founded 2,000 years ago by the Celtic Cavari peoples and they called it Aouenion meaning "the lord of the waters." The Phoenicians developed it in 600 BC after they founded Massalia (Marseilles). When the Romans took over, they called it Avenio. Nothing much happened there until 1309, when everything changed. After the short pontificate of Benedict XI (Benoît, in French), who died in 1304, the King France , Philip the Fair, politically engineered the election of the Archbishop of Bordeaux (Bertrand de Got) as the next pope. He took the name Pope Clement V and, because Rome had become impossible to govern due to all the different competing factions, Philip persuaded him to leave Rome and he was instead consecrated in Lyon. He had always planned to return to Rome but he died in 1316 and was succeeded by the former Archbishop of Avignon, Pope John XXII. Wanting a more worthy seat for the throne of Peter, he installed himself at Avignon. He ruled from 1316 to 1334 and was followed by Pope Benedict XII who ruled until 1342. It was he who started the building of the Palais des Papes (Papal Palace, below) in 1334. Next door is the Cathédrale Notre-Dame-des-Domes (begun in the 1100s) topped by a gilded Madonna in the 1800s. It took 18 years to complete and was finished at the end of the reign of Pope Clement VI in 1352. In 1348, Clement purchased the town for 80,000 florins and built the Palais Neuf (new palace). Pope Innocent VI reigned from 1352 to 1362, followed by Urban V for 8 years and Gregory XI for 8 more yrs. This period of the papacy was known as the "Babylonian Captivity." In 1378, St. Catherine of Siena persuaded Gregory XI to come to Rome for a visit. After his arrival he became sick and died before he could return to Avignon. The Roman mob seized the opportunity and physically forced the cardinals to elect an Italian pope, Urban VI, and he, of course, moved the papacy back to Rome. The French cardinals escaped, returning to Avignon and rebelled by electing an anti-pope, Clement VII (who reigned from 1378-94.) This caused a major schism in the Church which lasted until 1403. The next anti-pope was Benedict XIII (1394-1409), who fled from Avignon in 1403. The final end of the Great Western Schism was in 1417. 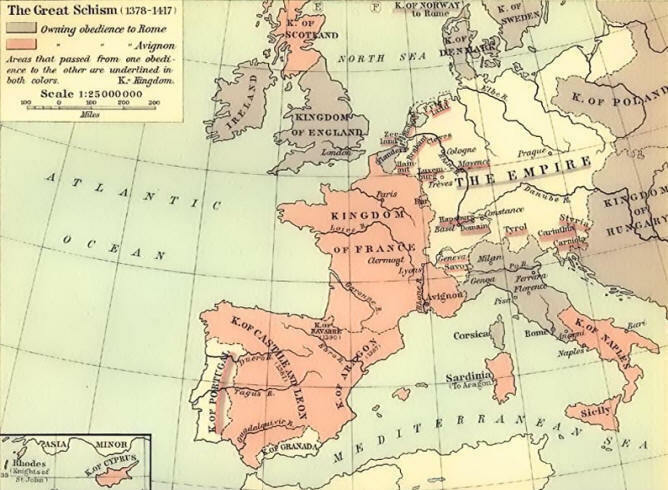 In the map above, the gray countries kept allegiance with the Pope in Rome and the red countries went with the Anti-Pope in Avignon. The others went back and forth between the two. Until the French Revolution, Avignon was administered by a Papal legate. In 1721 a plague killed 75% of the population of 24,000. In 1791, the city was united with France. Obviously, this changed the history of this little town and influenced art and culture throughout the whole region of the Vaucluse and Provence. The Avignon School of Art was formed. On the other hand, Petrarch (1304-74), the great Renaissance poet, hated that the Pope was not in Rome and considered Papal Avignon a "sewer" and a place of corruption. It is interesting to me that of the popes in my lifetime, two chose papal names of Avignon popes; John XXIII and our present Pope Benedict XVI. In looking up the papal name Benedict, I am guessing he probably named himself after, Benedict XIV (1740-58), who seems to be one of the greatest popes ever. If you are interested in this incredible man, click on his name. He is the pope who ended the ban against Catholics marrying Protestants by requiring the children be brought up Catholic. One of his quotes is, "The pope orders, the cardinals do not obey, and the people do as they please." Not much has changed in 250 years! ...which turns into Cours Jean Jaurés, out the large gate (Porte de La'Républica) and outside the walls onto rue de Rampart St. Roch (upper right). The train station (Gare) was across from the gate and I ran west toward the Rhône River and the Pont de L'Europe. Not knowing how far the next gate was, I returned by the same route. At 3:00 I found the FNAC electronics store and bought a new Canon camera. The same exact model (ELPH 500) is called the IXUS 700 here in France. I also bought two 1-Gigabyte photo chips and five DVD-RW discs to backup the photos on. The store had everything you could imagine in electronics. I never found out what FNAC stands for. At 3:20 it was now time to relax and have a cappuccino at Café Le Cid in Place de L'Horloge (the clock). I did a crossword puzzle and went through opening the new camera package. Unfortunately the user manual was in French; about as much use as the Spanish one Clara sent me. The nice thing was that it was a real cappuccino for a change. At 4:15 I took the new camera and re-shot many of the pictures I had taken last night with the broken camera. Here are other interesting shots of the events going on in the streets of Avignon. I went by their City Hall (Hôtel de Ville, below left) and their famous theatre (below right) which is the subject of this month-long fiesta of plays. Here (below left) is an example of the placard ads for one of the plays "Mon Cui sur la Commode." It seems that every "hippie" in the streets has a large black dog. This one was suckling a huge litter of pups. That was enough exercise for the day so at 5:00, I headed back to the room to change, shower, wash clothes and install the Canon software that came with the camera. I knew Marcia had already toured the Palace so at 5:45 I headed out to tour the Palais des Papes. This huge palace-fortress covers 3.7 acres (15 K m2) and is made up of the Old Palace (Palais Vieux) built (1334-42) by Benedict XII and the New Palace (Palais Neuf) built (1342-52) for Clement VI. Most of the original furnishings were destroyed or scattered during the French Revolution. They did not allow photography, so excuse the quality of some of the photos. After you enter the first room is the Jesus Hall with models of the Palace. The next room had excellent displays including historical items during the Papal period. There were photos of all the popes, samples of coinage of the era and even pie charts as to where funds of the papacy were expended in the 1300s. They displayed the actual handwritten documents of the Popes, such as encyclicals. Then you come into the Chapelle St-Roch where two Popes are entombed. I then entered a very large room called the Hall of the Consistory where the Cardinals met and received ambassadors. 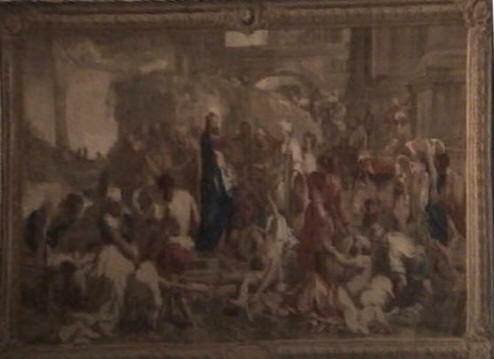 The you are led to the Grand Tinel which was covered with huge 18th Century Gobelin tapestries . It was here that the Pope held court and summoned the cardinals as well as received sovereigns and ambassadors. The process of canonizing St-Brigetta of Sweden was undertaken here. The east wall has a rosy hue due to the fire of 1413. The last room was full of Della Robbia-like life-size works. Some of the ceilings were quite spectacular. During the tour you wind up going to the top of the roof where there is a cafe (which was closed) and you get quite a view of the festivities below. I can't seem to remember why this little chest was important, but I will later. At 6:45 I was done with the tour and went past the area they now use for concerts and wound up in the Wine Shop which sells vintage and new wines from the Papal Estates north of here, the Chateauneuf-du-Pape. The popes built a new castle up there and planted many vines. The castle is now in ruins but the area produces some of the finest wines of the Côte du Rhône. I struck up a conversation with Matthias (below) and wound up buying 4 wine glasses but no wine. With a little prodding, he recommended a restaurant called La Tour as being very good. Across the courtyard from the Palais is the Hôtel des Monnaies which today is the Conservatory of Music. It was built in 1619 for the Papal Legate, Cardinal Borghese, whose coat of arms of dragons and eagles covers the façade. Marcia had told me by phone that she had been to the Palais and to the famous bridge, so at 7:15, I headed out following the signs to Pont St. Bénézet. You can see where the bridge is in the far-right city map photos at the beginning of this page. I arrived and saw there is a museum at the beginning of the bridge (above right), so I went in. My Palais ticket included admission here. They had a model of the bridge in the foyer. The story of the bridge is that a young shepherd boy named Bénézet, from the vicinity of Viviers, heard a heavenly voice commanding him to build a bridge here. On his way, an angel directed him to the Bishop of Avignon who tested him by asking him to lift a rock 30 men couldn't lift. When he did it, he carried it to the edge of the river to be the foundation for the bridge. From this, many donated to get it built and it was completed from 1177 to 1185. It spanned two arms of the Rhône river with 22 arches (900 meters; 3,000 ft long). I walked out to the end to look at the river and back toward the city. A couple asked me to take their picture so I asked them to return the favor. How Bénézet got to become a saint, is beyond me. It turns out he was never canonized but actually it is said he really existed. There is a little Romanesque chapel (Chapelle St-Nicolas) on the second arch where they interred him but his body was moved in 1674 and it was lost during the French Revolution. When you walk one level down, you see a little Gothic chapel. The bridge is the subject of the famous rhyme "Sur Le Pont d'Avignon." On my walk back I saw many works of art in gallery windows and posters for the over 600 plays and concerts being held. I passed some play participants pushing this gal in a painted trash bin and then at 8:10, I stopped for a Guinness at the L'Amercain Bar. Before going to the room, I decided I was dying for one of those omelets everyone was eating so at 8:30, I sat down at the place in front of our hotel called La Civette and had one with a glass of wine. It was a little mushy but wasn't bad. Marcia joined me and we headed out to participate in the continuous street goings-on before dinner. At 9:00 I brought her back to the L'Amercain Bar for a Guinness and a glass of wine. We struck up a conversation with a local playwright, Alan Rossett, who is originally from Boston. He has been here writing plays based on French themes for over 20 years. He was dressed up trying to sell people into attending his play, a comedy called "Chat Quit Peut." What a character he was. We weren't really in the mood for sitting through a play in French, even though he tried to convince us that we would understand it all. We left telling him we would think about it. We spent an hour walking through the crowds and finally headed for this restaurant which was off the beaten path, several blocks from the center. We almost missed it, it was so non-descript. At 10:30 we finally found it in a hidden courtyard and sat down for dinner at La Tour Restaurant [25 rue Carnot, +33-(0)4-32-76-2261]. We began with a bottle of local champagne, Grand Reserve Cairanne (Côtes de Rhône Village) and for starters, Marcia had Moules (mussles) and I had the tiniest clams I have ever seen, and they were fantastic (lower right). For an entree, I had magret de canard (duck breast) and Marcia had salmon. It was all very good. Matthias's recommendation was excellent. Throughout the evening (from the time we sat down) we were entertained by a Spanish guitar player from Malaga and a female dancer and later in the evening there were two girl dancers. They were very good. The music and the food were perfect. After dinner we met the owner. Her name is Tootsie and she claims she was named by Gen. Dwight D. Eisenhower during the war. Her 35 year-old son, Cedric, helps her and they were both extremely nice to us. We left and ambled our way back to the hotel. All in all it was a very romantic evening and I got to bed relatively early at 1:15 AM. What a day!